A little off the beaten path in the Krasnoyarsk Territory, Minusinsk was a crossroads for adventurers, exiles and entrepreneurs. One of the oldest Russian towns in the upper reaches of the Yenisei River, Minusinsk was founded by Cossacks in 1739 on the River Minusa, or Minusinka, a right tributary of the Yenisei. Although built on a flat plain, Minusinsk is surrounded by hills, and the Yenisei is only 6 miles west of the town. Minusinsk is located in a forest-steppe zone, where the dense northern forests gradually yield to open plains. The area is characterized by fertile soil and a climate that permits a relatively long growing season. Attracted by the good land, Russian settlers first came to the area in the early 18th century. However, the proximity of China led to an uncertain border situation, initially regulated in 1727 by a border treaty between Russia and China. Territory north of the Sayan Range was considered Russian, but the threat of Chinese incursions remained, and in the middle of the century, Cossack detachments were sent to guard the borders. During the 18th century, Minusinsk slowly grew as a small settlement linked to the area’s copper and ironworking factories. A more effective stimulus to local growth was a policy implemented in 1775-1776 of resettling peasants from northern Siberian villages to the better land around Minusinsk. This policy was aided by firmer Russian control of the border with China and initiated as a means of consolidating Russian presence in the borderlands. By the turn of the 19th century, Minusinsk had become a regional administrative center with almost 500 inhabitants. One notable event at the beginning of the century was the construction of the Cathedral of the Miraculous Icon of the Savior (1803-14), which replaced a wooden church built in 1779. Designed in “Siberian baroque” style by the Yeniseisk architect Stepan Dudin, the Savior Cathedral was erected primarily with donations from local residents — a reflection of the town’s increasing prosperity. The structure was expanded in 1854 with the completion of a north chapel dedicated to St. Nicholas, and in 1902-1904, the refectory was widened. Closed in the 1930s, the Savior Cathedral was reopened in 1943, during World War II, and has functioned ever since. Its interior decoration has been largely preserved. Take a regular flight from Moscow or St. Petersburg to Krasnoyarsk (travel time 4 hours) or Abakan (travel time 4.5 hours). Then take a local bus to Minusinsk. It takes about 7 hours to get there from Krasnoyarsk bus station and about 1 hour from Abakan. Like many remote Siberian towns, Minusinsk served as a place of exile for convicts as well as political dissidents, including certain prominent political thinkers, during the latter part of the 19th century. This aspect of the town’s history is memorialized in a spacious wooden house built in 1878 by the brothers Fyodor and Yefim Bragin, who had been exiled to Minusinsk from the Caucasus. Although they settled into a reasonably prosperous existence, Fyodor eventually resumed his political interests. In May 1897, three Marxist Social Democrats, arrested in St. Petersburg in 1896, stayed with Fyodor Bragin for several days before proceeding to their designated places of exile. During the Soviet period, the Bragin house was preserved as a memorial to two of the three: Gleb Krzhyzhanovsky and Vasily Starkov. The house and the structures in its courtyard now serve as a museum to 19th-century provincial life. The third Bragin guest was none other than Vladimir Lenin, exiled to the nearby village of Shushenskoye, where he lived in reasonable comfort until his release in February 1900. His wife, Nadezhda Krupskaya, joined him there in the summer of 1898. The entire Shushenskoye village was subsequently preserved as a major Lenin shrine. Despite its reputation as a place of exile, Minusinsk, like other Siberian towns in the mid-19th century, experienced a surge in economic activity based on gold prospecting. By virtue of this surge, much of the current town center — commercial buildings as well as houses — was built around the turn of the 20th century. Although lacking in industry, the town also benefited from the expansion of agriculture (including cattle farming) that met the needs of less productive regions of central Siberia. Economic growth led to an increase in retail trade, as stores and shops were built to meet consumer demand. The most imposing example is the former Vilner building, a grandiose 3-story emporium in an Italian Renaissance style that has been named “Siberia’s Winter Palace.” Its owner, Grigory (or Hersch) Vilner, had an intriguing biography that says much about the possibilities available in Siberia to enterprising individuals. Although certain details are unclear, he was apparently the third generation of a Jewish family that had arrived in the area by 1837. There were a number of Jewish communities in 19th-century Siberia. Some arose from Jews who completed military service in the region and were allowed to settle in an area that could offer greater opportunity than the Pale of Settlement. Despite restrictions on Jewish residence outside the Pale, Jews also moved in response to an acute need for trained professionals in the development of Siberia. Vilner’s father, Mark, did well in the gold and fur trade, and in 1884 established the Vilner Retail Trade Firm. Continuing the firm’s expansion, Grigory bought a large plot of land in the town center in 1897 and at the beginning of the 20th century began construction of the town’s largest emporium, completed in 1912. The first floor of the three-story Vilner building contained not only a store, but also a bakery, a café (“De la Paris”) and a cinema. The second floor housed a branch of the Siberian Trade Bank and the third floor, a newly established high school. The Vilner building was something of a forerunner of the modern shopping center. After the 1917 revolution, the Vilner family dispersed. Grigory moved to the Manchurian city of Harbin, but then returned to the Soviet Union to join a daughter who lived in the Irkutsk Region. He later moved to Leningrad, where he resumed work in the Soviet fur trading enterprises. He subsequently perished in the 900-day Siege of Leningrad. During the Soviet period, the Vilner building was used by a variety of institutions, including regional administration offices. By 1994, the building was no longer occupied, and without necessary maintenance, it fell into disrepair. Today it stands as an empty shell while plans for its restoration are being proposed. Renovation of the property will not be an easy task, but abandoning such a major structure would be a significant loss for Siberia’s architectural heritage. Another notable Siberian entrepreneur, Gennady Yudin, began his commercial activity in Minusinsk before moving to larger operations in Krasnoyarsk. Yudin became a major cultural patron and is known for a collection of thousands of books that he donated to the Library of Congress in Washington, D.C. In the latter part of the 19th century, Minusinsk gained various cultural and educational institutions. Foremost among them was the large Regional History Museum, founded in 1877 by Nikolai Martyanov, a pharmacist and polymath. The local response to the collection was so positive that funds were gathered for the construction of a special museum building, begun in 1887 and completed in 1890. With its ornamental brick facades, the original museum (now expanded) still adorns the town center. Following the proclamation of Soviet power in November 1917, Minusinsk was gripped by civil war as warring factions, including Cossack insurgents and red partisans, fought for control of the area. By the end of 1919, communist forces led by Alexander Kravchenko and Peter Shchetinkin had established Soviet power, although local uprisings continued in the area until 1924. The town’s rebellious reputation may have contributed to the severe repressions to which it was subjected in the 1930s. After a number of attempts beginning in the early 20th century, rail service came to Minusinsk in the early 1960s with the construction of the line from Abakan to Taishet, which is on the TransSiberian mainline in Irkutsk Region. The station, however, is about 11 miles from town, and getting to the city from the regional capital of Krasnoyarsk by rail is considerably longer than by highway. The most convenient means of transportation is by car or bus via Abakan, capital of the Republic of Khakassia. The total length of this trip is 270 miles. The sleek design of Minusinsk’s new bus station stands in sharp contrast to its traditional architectural surroundings. Minusinsk in the post-Soviet period has maintained its administrative and cultural presence in the region. Apart from the large Regional History Museum and branch institutions of higher education, the town also has the Krasnoyarsk Regional College of Culture and the Arts. 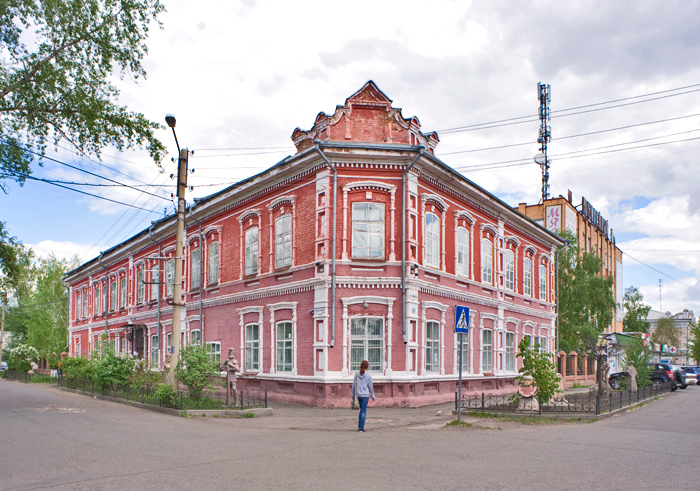 Despite economic challenges, Minusinsk still has a substantial resource in its pre-Soviet architectural ensemble, which preserves to an unusual degree its frontier merchant heritage. These historic buildings are not only an important part of the town’s culture but also provide a basis for the development of tourism.